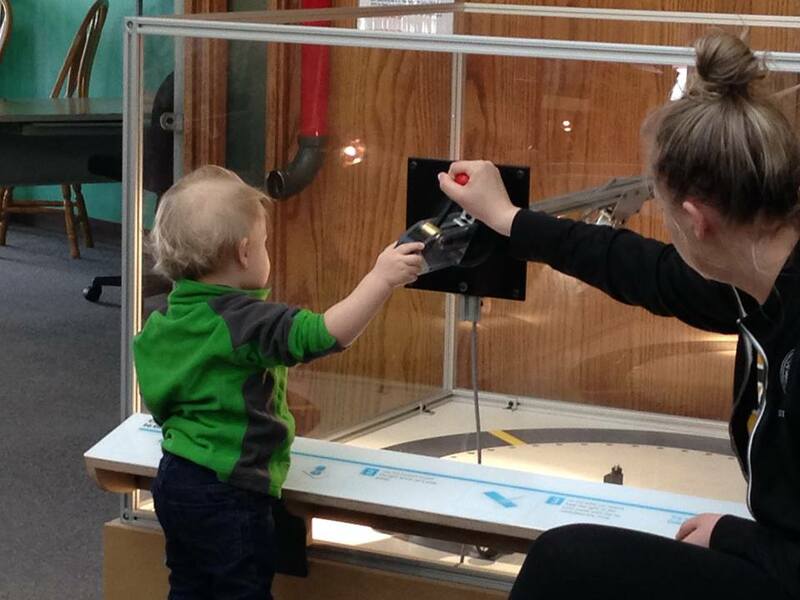 North Dakota’s hands-on science center for all ages inspiring the scientist in everyone! Spring STEM Spectacular – Saturday, April 27, 1-4 p.m.
Join us for a free STEM (science, technology, engineering and math) event with hands-on activities for all ages (babies and toddlers up to grandparents). The Spring STEM Spectacular offers a wide array of activities such as rotocopters, shrinky dinks, circuits, create your own insect, LEGO design challenges, and toddler play area. New activities from the Earth and Space kit provided by National Informal STEM Education Network (NISE Net) include static electricity, temperature mapping, and Space Guess Quest game. Exclusive preview for Gateway to Science members from 12:30-1 p.m. Opens to the public at 1 p.m. All STEM Spectacular activities are FREE. The regular Gateway to Science exhibit gallery admission for non-members is $5/person during the special event hours. Gateway to Science will be offering our summer science exploration program, STEM Adventure Camp, for children entering grades 1-5 in the fall of 2019. This summer, we will also be offering two weeks of camp for students entering grades 6-9. Every day of every week is a new adventure, with plenty of fun STEM projects and activities. We do our best to build camp activities around the interests of students registered for each week of camp. In addition, professional scientists may drop in throughout the summer to share STEM lessons and activities to give campers a taste of “real-life” science! Gateway to Science offers full and half day options, with the first camp week scheduled for May 28-31. Register today! Science First Friday is a special time set aside for early learners to be in the gallery exclusively. The Science First – For Early Learners area within the gallery offers age appropriate hands-on activities for ages 0 – 5 and their families focusing on themes such as sorting, building, magnetism, and sensory exploration. Coffee is available during Science First Fridays, or bring your favorite coffee with you (covered containers only, please). The Science First area is open any time the gallery is open. And on Friday mornings, we offer an EXCLUSIVE hour in the gallery from 9:00 a.m. to 10:00 a.m. for children birth to 5-years-old and their families. Regular admission rates will apply; members admitted free. Preschool Discovery Hour is a unique program for preschoolers (ages 3-K). It allows them to informally learn science concepts with their favorite adult, without the pressure of understanding everything. The sessions are fun and hands-on. Each week’s lesson can stand alone, so come when you can and don’t worry when you can’t! No pre-registration is required. Preschool Discovery Hour is from 10:30 – 11:15 am on select Saturdays. The next PDH sessions are set for May 4, 11, and 18. Preschool Discovery Hour is for children ages 3 years – Kindergarten and their parent or other favorite adult. We allow up to two children per adult. Each child will be charged separately. Preschool Discovery Hour is FREE for Gateway to Science members. Non-Members may pay $7.00 per session. Check the Preschool Discovery Hour schedule for more dates. Your donation will support Gateway to Science educational programs and help us to inspire the scientist in everyone! Hours may vary on holidays.